People with a weak immune system, particularly infants, are at a high risk of contracting meningitis. This inflammation of the brain and spinal cord membranes can cause cognitive deficits or even death. Meningitis can be viral or bacterial. Viral meningitis can often resolve on its own. Bacterial meningitis is much more serious and can lead to dire consequences for your baby. Infants are susceptible to meningitis when they contract a viral or bacterial infection, which can spread to the spinal cord and brain fluid and lead to meningitis. Babies are most likely to develop meningitis when they develop an infection. Typically, these infections are passed through the mother during pregnancy or during the delivery process. It is the responsibility of the doctor to test the pregnant mother for infections, particularly Group B strep, at 35 to 37 weeks. Because the mother will often not show symptoms of this strep, the doctor must test for it so that antibiotics can be administered before the infant arrives. If the doctor fails to test and identify strep in the mother, the infection can cause the meningitis birth injury. Infections affect many infants, so it is important for doctors to be proactive in their treatment. Symptoms of infant meningitis are headaches, fevers, nausea, poor feeding habits, neck stiffness, and confusion. Unfortunately, some of these symptoms are difficult to determine with an infant. In order to diagnose meningitis in an infant, the doctor will perform a spinal tap. It’s an extreme measure, but the meningitis must be treated immediately, before it can lead to brain damage, cerebral palsy, or death. A quick diagnosis is key. Following the meningitis diagnosis, the baby will be given antibiotics or antiviral medication. A stay at the neonatal intensive care unit will also be essential for recovery. With proper treatment, the baby should make a full recovery. However, if the doctor has been slow in the diagnosis or treatment of the child, it could be considered medical malpractice. Meningitis affects the membrane around the child’s brain, and brain damage or death can occur quickly. 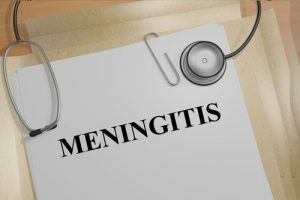 If your infant was diagnosed with meningitis too late (or not at all), you may want to file a malpractice suit. Call Thurswell Law immediately at 248-354-2222 for a free consultation. We will work to make sure you receive fair monetary compensation for your baby.